Obviously, ingenuity doesn’t always equal common sense. There are new examples every year of people strapping ridiculous amounts of propulsion power to things that they really shouldn’t. 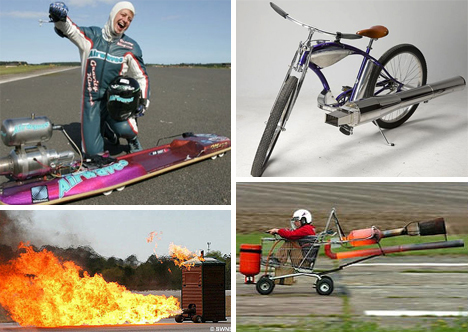 These eight examples show just how crazy some people can be with their jet engines and rocket power. We really don’t condone trying any of these at home. Nope, that portable toilet isn’t on fire. It’s just, for some reason, equipped with a Boeing jet engine. 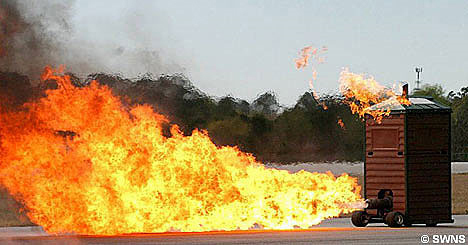 The port-a-potty goes can reach a speed of 70 mph and shoots a trail of fire behind it up to 30 feet long. Paul Sender, a mechanic, spent thousands of dollars building this monument to WTF-ness. There probably aren’t many of us out there who have never hopped onto or into a shopping cart and taken a quick ride. Andy Tyler, however, takes that innocent ride to a dangerous new level with his rocket-powered shopping cart. He got instructions for building the jet engine on the internet and decided to affix it to a shopping cart he’d fished from a river. The powerful engine reaches very high temperatures, so Tyler had to equip the cart with a heat shield. The crazy car can go up to 50 mph before getting a bit wobbly, but at least it’s got a steering system and brakes. 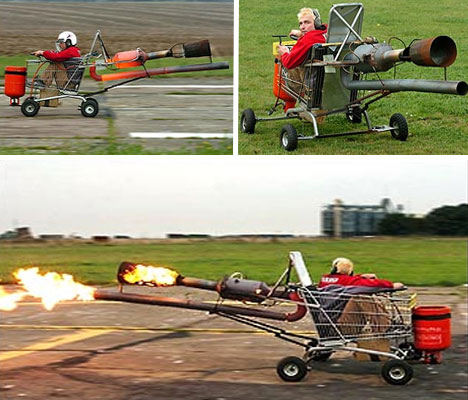 A jet-powered lawnmower may sound like a good idea at first, but then you realize that you can’t actually mow the lawn with this thing. Gary Packham’s crazy “Turbitrac” tractor mower features a homemade gas turbine engine. If you’re just aching to make one of your own to freak out the neighbors, there are detailed instructions on Packham’s website. Unfortunately, the top picture from Allegro Medical is just a joke, though a very well-executed one. 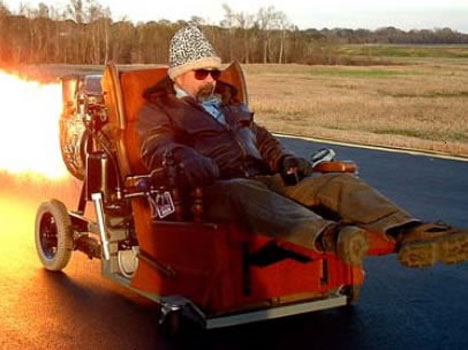 But an enterprising man in England did, in fact, make an actual jet-powered wheelchair. 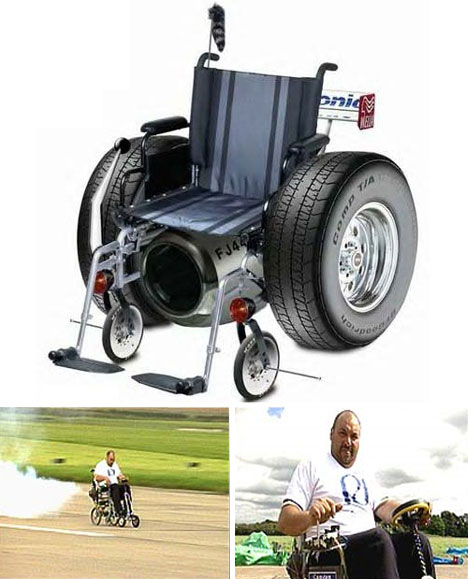 Giuseppe Cannella somehow found himself with a spare jet engine, and at his wife’s suggestion decided to strap it onto his mother-in-law’s wheelchair. Luckily the MIL, who has Parkinson’s Disease, had already purchased a new wheelchair. Cannella puts on shows with the wheelchair to raise money for Parkinson’s Disease research. Some people say that their favorite armchair is so comfortable they never want to leave it. You could definitely increase your sitting time by equipping your fave chair with a jet engine, just like Bill Decambre did. This insane invention manages to look even more unsafe than most of these others, yet he looks totally at ease riding around on it. Now if you just attached a TV to it, you could spend your last moments comfy and entertained. Luges are supposed to go fast and be sort of deadly, but this one is going way further than you’d expect. 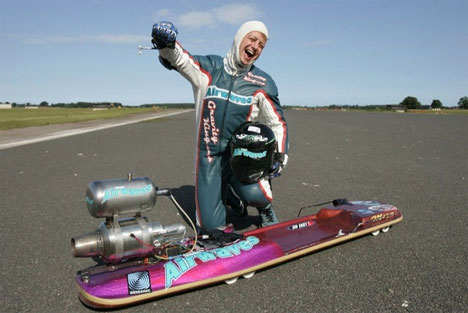 Joel King used a small jet engine, one normally used on gliders and unmanned aircraft, to build this street luge. On it, he reached a speed of 112 mph, breaking the previous world speed record. Going that fast, inches off of the ground and with a jet engine centimeters from your head, must be exhilarating but pretty dang scary. 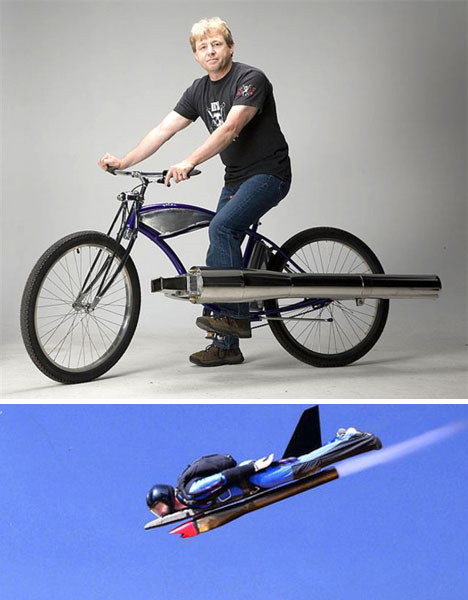 If you think that bicycle + motor = motorcycle, you probably haven’t seen Bob Maddox’s jet-powered bike. The Oregonian artist/cabinet maker likes playing with jet pulse engines, so he decided to start strapping them onto bicycles and selling them on eBay. Mind you, this was only after skydiving with a rocket strapped to his chest because, according to him, he thought “itâ€™d be fun to strap a jet engine to my chest and make myself into a human missile.” Sure, if that’s your idea of fun. The jet-powered bikes have gone up to 50 mph and are loud enough to pop your eardrums if you’re not wearing protective gear. See more in Mods & Custom or under Transportation. October, 2009.